The meeting, which convened to consider the recent report of the UN Secretary General Ban Ki-Moon, was also attended by the Special Representative of the UNSG, Staffan di Mistura. He said for the coming years Afghanistan would pursue a comprehensive strategy to implement the outcome of the London and Kabul Conferences. 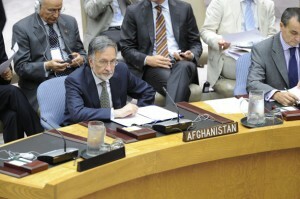 He further asserted that Afghanistan would work towards gradual leadership in all areas, including security, development and governance.Â On security he said Afghanistan would strive to build the size, capacity and operational capability of its security forces â€œfor taking the lead role in combat operations in volatile provinces by 2011, and meeting the securityâ€™s security obligations independently by 2014, with international forces offering back-up support.â€Â He also reiterated Afghanistan appeal for continued international support and assistance in the building of Afghan security forces. Further, he highlighted the up-coming NATO Summit in Lisbon, at which the Afghan government would come together with partner-countries to â€œcrystallize our joint strategy for transition to Afghan security lead over the coming years.â€ At the conference Afghanistan would also update its international partners on progress in strengthening Afghan security forces. He however asserted that civilians continued to â€œpay a staggering price in the ongoing conflictâ€ in the country. He said over six thousand Afghans, including women; children and the elderly were killed and injured in just last year. In that regard, he said the Taliban, Al-Qaeda and their terrorist allies continue to show complete disregard for human life, embracing assassinations and executions in an effort to control the population through terror. Moreover, he welcomed the increased measures by former ISAF former commander, General McCrystal, aimed at better protecting the lives of civilians.Â He expressed confidence that civilian protection would continue to receive due consideration from ISAFâ€™s new commander, General Patraeus. Ambassador Tanin also said the safety of the Afghan people should remain a priority, and it was necessary to enhance collaboration for strengthening the trust and confidence of Afghans in future efforts. At the outset, let me thank you, Mr. President, for convening todayâ€™s meeting on the situation in Afghanistan, and congratulate the government of Turkey in assuming the Council Presidency for the month of September. I also thank Secretary General Ban Ki-Moon for his most recent report on Afghanistan, and SRSG Staffan di Mistura for his comprehensive briefing. Todayâ€™s meeting comes at a crucial time in Afghanistan just over three months after the Kabul Conference, and less than two weeks since the holding of our parliamentary elections. I am pleased to be among you today, to discuss the current situation in Afghanistan, and shed light on the strategy we will pursue to end violence, and achieve lasting peace and security. I want to begin by saying a few words about our recent elections, which gave Afghans another chance to shape their future, and consolidate our young democracy. Millions of Afghans from all segments of society braved intimidations and threats of attacks, including assassinations, to cast their vote.Â As such, Afghans reaffirmed their steadfast commitment to democracy and self-determination. The unprecedented number of young candidates and voters illustrates the degree to which democracy is taking root in Afghan society. Further, the significant increase in womenâ€™s participation is testament to the further empowerment of women in Afghan political life. Our elections were a major victory for democracy in Afghanistan. Let me take the opportunity to convey our gratitude to the United Nations and other partners for providing financial and technical support for our elections. Just three months ago, Afghanistan and our international partners gathered at the international Kabul Conference to renew our partnership for durable peace, security and stability.Â Together, we adopted the â€œKabul Process,â€ which focuses on increased Afghan leadership across the board. We also presented our 23 national priority programs, including the national security policy and our national reconciliation initiative, all of which were endorsed by the international community. Going forward, Afghanistan will pursue a comprehensive strategy to implement the outcome of the London and Kabul Conferences. We will work towards gradual leadership in all state of affairs, security, development and governance in particular. Our objective is clear: a gradual transfer of responsibilities towards self-reliance in ensuring social and economic opportunities for all Afghans, and enforcing the rule of law throughout the country. In the area of security, we will work to build the size, capacity and operational capability of Afghanistanâ€™s national security forces.Â In doing so, we will meet a vital pre-condition for taking the lead in combat operations in volatile provinces by 2011, and for meeting our security obligations independently by 2014, with international forces offering back-up support. In achieving this goal, I want to reiterate the importance of sustained international support for the training, resourcing and equipping of the Afghan national army and police. Moreover, we have committed to a comprehensive social and economic agenda to improve the lives of all Afghans, and achieve a sustainable Afghan economy. In particular, we are giving special focus to agricultural development, rural rehabilitation, human resource development and economic and infrastructure development to generate employment opportunities and meet the immediate needs of our people. I seize this opportunity to convey Afghanistanâ€™s thanks and appreciation for the international communityâ€™s support and assistance. Meanwhile, it is noteworthy that Afghanistan will not be able to realize its development goals without greater responsibility for our finances. Afghans must have a greater role in their own development. 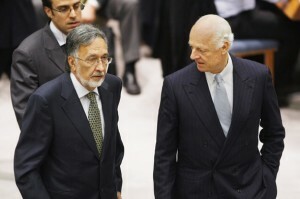 We welcome the international communityâ€™s decision to channel 50% of donor assistance through our national budget by January 2012. Â This will lead to greater transparency and efficiency in utilization of development assistance by donor countries. At the same time, we have embarked on a reinvigorated effort to combat corruption, and strengthen governance at all levels. Afghans are well aware of the detrimental effect of this menace on the dignity, image and prosperity of our country. We are fully committed to ridding corruption from our society effectively and resolutely. In less than two months from now, Afghanistan and its NATO partners will gather at the NATO Summit in Lisbon to crystallize our joint strategy for transition to Afghan security lead over the coming years.Â We will update our international partners on our progress in the building of our security forces, and discuss remaining challenges to that effect. For transition to succeed, we first have to find a solution to Afghanistanâ€™s ongoing security problem. Afghanistan has endured violence for more than thirty years. Â Almost ten years since the start of our joint efforts to stabilize Afghanistan, security remains a problem. We have prioritized ending violence and providing Afghans with what has eluded them for decades: the chance to live in peace and security. There will be no peace unless military efforts are complemented by a robust and comprehensive out-reach initiative. That is why President Karzai launched a â€œreintegration and reconciliation initiative to ensure an honorable place in society for members of the armed opposition who are willing to surrender arms, renounce violence, accept our constitution, return to normal life and embrace international human rights. We recently established the â€œHigh-Peace-Council,â€ to oversee the implementation of our reintegration and reconciliation. The High Council is now operational and will meet regularly. In addition, we welcome the Security Councilâ€™s review and updating of the 1267 consolidated list as important for implementing our peace initiative.Â In this regard, we look forward to additional updates, on the basis of additional delisting requests. Terrorism poses a grave threat to the security and stability of our region and beyond. In this regard, we remain concerned at the continued presence of safe-haven and sanctuaries in our region where terrorists receive recruitment, training and logistical support. It is ever more evident that addressing the challenges facing Afghanistan and our region, including terrorism, extremism, and narcotic drug production and trafficking will not be possible without meaningful cooperation at the regional level. For our part, Afghanistan remains fully committed to a sincere and effective dialogue with Pakistan and other regional countries for security and prosperity in our region. Just recently, together with the government of Pakistan, we signed the Afghanistan-Pakistan-Trade and Transit Agreement (APPTA), aimed at increasing bilateral trade and generating employment opportunities. Moreover, the signing of the Turkmenistan-Afghanistan-Pakistan-India (TAPI) gas pipe-line project and the conclusion of the feasibility study for the CASA 1000 project for transfer of energy in the region are milestones for the development and prosperity of our region. We are both confident that these projects will benefit security and stability in Afghanistan and the region and strengthen mutual trust and confidence. 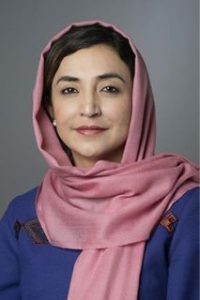 Afghanistan is confident that by pursuing our comprehensive national agenda for security, development and governance, and by implementing our reintegration and reconciliation initiative, we will succeed in stabilizing Afghanistan and preventing the enemies of a stable and prosperous Afghanistan from regaining control of our country. 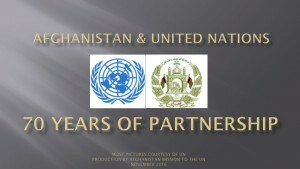 Nine and a half years since the beginning of our partnership with the international community to defeat terrorism and achieve a stable and prosperous Afghanistan, we have come a long way. We attribute our achievements to the sacrifices of the Afghan people and the troops of our partner countries. A transition to increased Afghan responsibility and ownership will be our main priority over the coming years.Â We expect our international partners to remain by us with fortitude and commitment to ensure the successful conclusion of that transition.